The Dragon King Sword with Sheath embraces both the majesty and ferocity of the most feared fantasy beast. 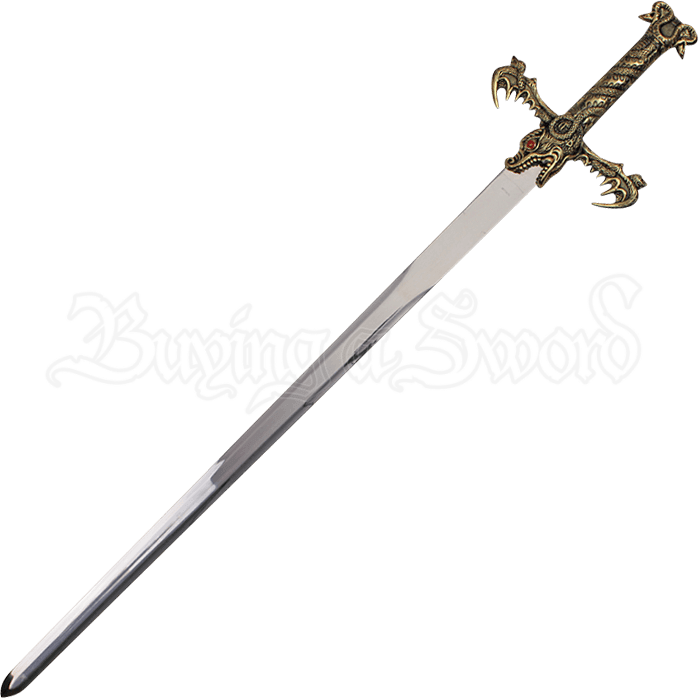 This stainless steel sword features an intricately detailed, medieval style dragon forming its antique brass tone hilt. The metal hilt features the toothy maw of the beast at the center of its guard, so the blade is framed as though emerging from its jaw. Intertwined with scaly serpents, the spiky wings of the dragon form the crossguard as the dragons twisting form gives texture and interest to the round grip. A double headed serpent adorns the matching pommel. The included sheath, made of wood and coated in black faux leather, features matching antique brass detail at its opening and tip, creating a cohesive fantasy masterpiece. Bring the might of a dragon king into your home with this decorative fantasy sword. Gorgeously detailed, this dragon sword is the perfect addition to sword collections and medieval fantasy displays.